After the Green Party of California (GPCA) qualified for the ballot in January 1992, it adopted election rules regulating how Green candidates were selected for partisan office. It then sued for the right to have these rules and was initially victorious, winning None of the Above (NOTA) and open/closed primaries. But the party lost these in 1995 upon appeal by the California Secretary of State. Today the GPCA is seeking to pass a Green Party section of the state election code, which would institutionalize ranked choice voting for county council. January 10, 1992: The Chief of the Elections Division of the Secretary of State's Office, Caren Daniels-Meade, notifies county registrars of voters about issues that will arise with the impending certification of the Green Party of California as a qualified political party. 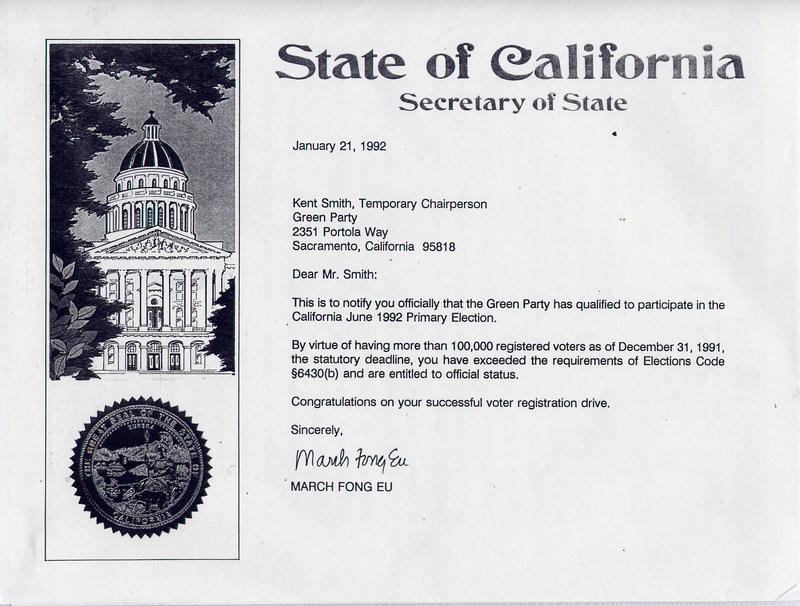 January 21, 1992: The Green Party of California (GPCA) is officially certified as a qualified political party by the Secretary of State, based upon the 100,897 Green registrations gathered by December 31, 1991, more than the 78,992 needed to qualify the party. January 25-26, 1992: The GPCA holds its first statewide meeting after achieving ballot status, meeting in Sacramento. In an attempt to assure the new Party's key values be melded with California law - and especially to protect the Party's integrity in its first electoral outing, the party adopted an alternative set of election rules - differing from any other ballot-qualified party in California. This 'adoption of alternative rules' was contrary to the California tradition/practice of accepting the rules of another party first, then petitioning the state legislature for new rules later. • all partisan races would be declared closed unless the regisered members of a given county or district ask that the races be open to candidates (this rule had received 92% support at the GPCA statewide meeting). • blank ballots should be tallied and used to determine if any candidate should go forward to the general election, such that if there were more blank ballots than votes for any candidate, the party will be deemed to have no candidate (this rule was supported by consensus at the January 25th-26th GPCA statewide meeting). February 3, 1992: The GPCA appeals the Secretary of State's administrative ruling to the Superior Court of California, County of Sacramento. Mark E. Merrin, of Dicksen & Merin in Sacramento, is the Attorney for the GPCA. (1) in all GPCA races in which elections are held that the ballot choice “none of the above” (NOTA) shall be placed on the ballot (Order, RP 124). Election officials must tally all votes marker for NOTA. If NOTA receives more votes than any candidates for that race, the party will be deemed to have no candidate. (2) GPCA primary elections would occur only in those races for partisan offices where, under GPCA rules, the party has first decided that any given GPCA race shall be opened to candidates. Note that the GPCA had originally not asked specifically for NOTA, but rather 'that blank ballots be counted, and if they receive more votes than any candidate, the party would be deemed to have no candidate'. Judge Ford altered this by-law to NOTA, with the GPCA's assent. The court's decision was then appealed by the Secretary of State. The GPCA's rules were allowed to stand in the 1992 and 1994 elections before the case was decided January 19, 1995. February 13, 1992: Anthony (Tony) Miller, Chief Deputy Secretary of State, advises the county clerks/registrars of voters how to implement the GPCA's newly won election rules. March 2, 1992: Two legal challenges were made to the GPCA's closing of certain legislative districts - by the Green Party of Mendocino County and by David "Honey" Davis of Hollywood. Judge Ford denied these challenges and upheld his earlier ruling, finding that the GPCA had followed its process properly, and that the GPCA had the right to establish its own rules. June 2, 1992: Greens participate in a California primary election for the first time and NOTA defeated Roger Donaldson in the 53rd State Assembly District, 207-171 (54.8% - 45.2%), after Donaldson decides to pull out of the race. On May 28, Donaldson sent this mail piece to all of the registered Greens at the last minute, urging them not vote for him. Other high votes for NOTA were in the 51st Congressional District (San Diego County), where NOTA received 31.5% vs. Richard Roe (122 votes to 265) and in the 5th Congressional District (Sacaramento), where NOTA received 26.1% vs. Tian Harter (233 votes to 660). June 17, 1992: The Chief of the Elections Division of the Secretary of State's Office, Caren Daniels-Meade, responds affirmatively to the GPCA's request to have its County Council terms begin on E+30, which in 1992 would be July 2nd, and advises the County Registrars of this determination. November 14-15, 1992: The GPCA meets in Monterrey. Delegates allow the party's open/closed primary rule to sunset effective January 1st, 1993. NOTA remains in effect. January 1994: The GPCA meets in San Francisco at New College. Delegates vote to reinstate the open/closed primary rule with 80.5%, just enough to clear the party's 80% threshold for bylaws revisions. A vote is then taken to close the governors primary and it achieves approximatley 65%, not enough to close it. Ultimately three candidates enter the governors race and qualify for the primary ballot - John Lewallen, James Ogle and John Selawsky. June 7, 1994: NOTA received the most votes for Governor, finishing ahead of three other candidates. A vigorous Friends of Nobody campaign was waged in favor of NOTA. One of the three Green gubernatorial candidates supported NOTA - John Selawsky, and he used his ballot statement to advocate for a vote for it. January 19, 1995: The GPCA loses NOTA in Green Party of California vs. Jones. The case was an appeal by the state of California, over whether the First Amendment protects a political party's right to decide for itself whether to have none of the above on its own primary ballots, and whether it may close nominations for particular offices, so that no one may run in the primary for such an office. A more in-depth discussion of the issues involved can be found here.